Victorian naturalist Alfred R. Wallace argued already in 1892 that changes of Earth’s surface could explain the modern distribution of plants and animals. He believed that sea-level rise or earthquakes played a major role, modifying the shape of the continents. Almost twenty years later German geophysicist Alfred Wegener explained the distribution of modern land-snails, found in Europe and North America, as a result of continental drift. He argued that all continents were once united in a single landmass named Pangaea (meaning “all, entire, whole Earth” in Ancient Greek). The ancestors of the snails became separated during the breakup of this former supercontinent and evolved independently as the continents of America and Europe drifted apart. Since Wegener, many biologists have confirmed his explanation and used continental drift to explain the distribution of closely related species, like the African ostrich, the Australian emu and the American rhea. Today geologists can even use the distribution of animals to reconstruct the former position of continents and how and when they became separated. 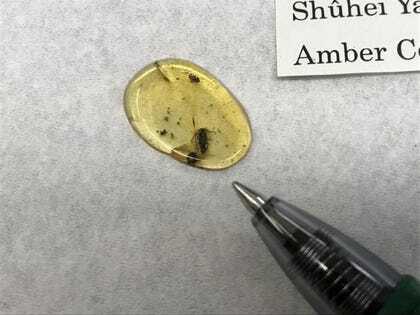 Propiestus archaicus is a fossil species of rove beetle, described from a small amber piece found in the Hukawng Valley of northern Myanmar, near China’s southern border. Rove beetles are a very successful group of beetles with more than 63,650 species distributed worldwide and about 400 new species are being described each year. P. archaius is a mere 0.1 inches long, a common size for a rove beetle. It likely lived beneath the bark of rotting trees, using its long antennae to find its way around in its habitat. So this discovery may not seem extraordinary, however, this fossil find rewrites the history of the formation of modern-day continents some 99 million years ago. P. archaius belongs to a family of rove beetles found today almost exclusively in South America, except for one species found in southern Arizona. This distribution over three continents, North and South America and Asia, can only be explained if all continents were connected once. The supercontinent Pangaea began to slowly break up about 250 million years ago. Around 150 million years ago two larger landmasses formed, Laurasia in the northern hemisphere and Gondwana in the southern hemisphere. Gondwana was formed by the modern continents of South America, Africa, Antarctica, Australia and India. The southern continent of Gondwana began to break up 130 to 90 million years ago. Most notably India began its long journey north, finally colliding with Asia and forming the Himalaya. The tiny fossil rove beetle suggests that also Myanmar once was part of Gondwana. The early ancestors of modern rove beetles likely evolved in an area of Gondwana that is now part of South America. One species spread over land north, in what is now modern Arizona. Another species migrated to the eastern coasts of Gondwana. When a large chunk of the eastern coastal region of Gondwana broke off, the local population of P. archaius drifted together with this terrane, as smaller parts of continental crust are called, north. Eventually the isolated population of Propiestus went extinct. When the terrane collided with Asia, becoming part of modern-day Myanmar, only the specimen entrapped and preserved in amber survived.